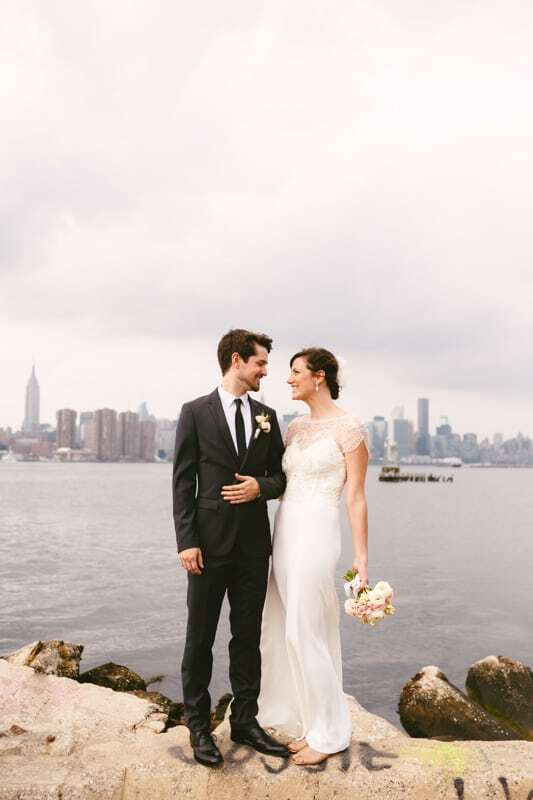 Stood in front of the one of the worlds most famous landmarks, Lynsey and Carl were married at the East River State Park in Brooklyn, overlooked by the spectacular Manhattan skyline. This couple were incredibly lucky to have lots of help with what they described as the DIY wedding of the century. With lots of family and friends involved in the artistic community the couple were able to design their own Wedding stationery whilst friends helped with decor, entertainment and catering. When we started to plan our wedding one thing was clear: Even though we weren’t originally from New York, it’s become the place we call home and it’s where we wanted to say, “I do.” We chose to hold the ceremony at East River State Park in Brooklyn, which is a 15-minute walk from our apartment, and, over the years, has become a favorite spot of ours because of it’s perfect view of the Manhattan skyline. With most of our friends and us being involved in theatre, film, or the artistic community our wedding was the DIY of the century. We designed our invitations, programs, and thank-you notes, and we found a gorgeous laser cut leather bound book at a thrift store that we used as the guestbook. Our friend Rebecca created the beautiful flower arrangements for the ceremony. Stephen Elkins and Alex Sovronsky played gospel and bluegrass music on guitar and violin. Our friends Dean and Brett decorated the reception with lights, table arrangements, and even more flowers. The good folks at Kingston Hall were willing to open on a Sunday to welcome us with an amazing deal on an open bar and delicious food by chef David Conn from sister restaurant Ninth Ward. Bo McGuire, whose welcoming words as our officiant included everything from the Song of Solomon to the lyrics of Dolly Parton, made time to bake pecan and blueberry pies for our dessert table. Our long-time friend Donald Sanders designed the wedding dress, and the talented Mariah Hale stitched it together perfectly. Our friend from college, Mary Margaret Smith took our exceptional wedding photos. We had an army of a wedding party, and they took care of every little detail while we enjoyed our day, every magical moment of it. In the end, it’s not about the flowers, the food, or even the dress. It’s about who surrounds you on that special day. We were lucky enough to be surrounded by the most talented, generous, and thoughtful friends and family of anyone we’ve ever known. They helped make our dream wedding come true. I love how Lynsey and Carl chose to marry at their favourite spot. Even something as simple as marrying at your favourite location can make all the difference. If you could get married anywhere, where would it be? Who else thinks Lynsey absolutely nailed it with her final advice! I’m biased, but I love a good NY wedding! That dress is spectacular. You couldn’t ask for a better location. Emily, thank you so very much for not only sharing this wedding, but putting so much thought into the post. It looks amazing, and I am thrilled to see these photos on your beautiful blog!! LOVE IT!